Home › Uncategorized › "WHEN THESE THINGS WILL CEASE"
"WHEN THESE THINGS WILL CEASE"
This is a graphical explanation of 1 Corinthians 13 to show when the things that are miraculous (tongues, knowledge, prophecy) will cease, and to show the things that will continue (i.e. Faith, hope, love, and truth). 1. Verse 8 says these miraculous helps of the Holy Spirit will be done away. When is the question. Is it when we attain heavenly perfection or is it when we know in full and no longer need the help of the miraculous helps of the Holy Spirit, as they did in the first century? 2. Verse 9, the two “parts” make a whole. To “prophesy in part” facilitated and completed what they already know with the incompleted (at the time of writing Corinthians) Scriputre. 3. Verse 10, the word for “Perfect” is never used for the perfection of heaven, but has to do with the completion or maturation of the things in question. James uses the word to refer to the “perfect law of liberty” and the “perfect” man who controls his tongue. The maturation of “knowing in part” would be the knowing in full with the completed New Testament; in other words, no longer needing the prophecy, tongues, and knowledge (which was supernatural knowledge from above). 4. Verse 11, “when I was a child”? “I did away with childish things”? Take note that “putting away” and “the partial” being “done away” are parallel, and “they will cease.” Thus making the supernatural gifts — tongues, prophecy, and knowledge — the “childish” things which will no longer be necessary when once the perfect comes. The supernatural gifts are “childish” in the sense that they pertain to aiding the infant church, helping it “get off the ground”. A mature church won’t need these things as the members will base their faith on the testimony of God’s completed Word, and will have no need for the gifts that have been a help (and sometimes a hindrance, see 1 Corinthians 12-14 for a taste of how the gifts could be a hindrance and help). 5. Verse 12, “now we see in a mirror dimly” is parallel to “know[ing] in part” of verse 9. Without the help of the “childish things” (verse 11), the church’s knowledge would be very dim. With the prophecy, tongues, knowledge, the full knowledge of the Gospel was instantly available through the gifted prophets. “Then I will know fully” is not referring to heaven, but it refers to the time when the “childish things” are no longer necessary. The complete New Testament will be available and each person will have access to the full amount of knowledge that God chose to reveal. 6. Verse 13, “But now faith, hope, love, abide these three;…” The word for “abide” is a specific contrast to the things that will not abide, the things that will cease and be done away with. 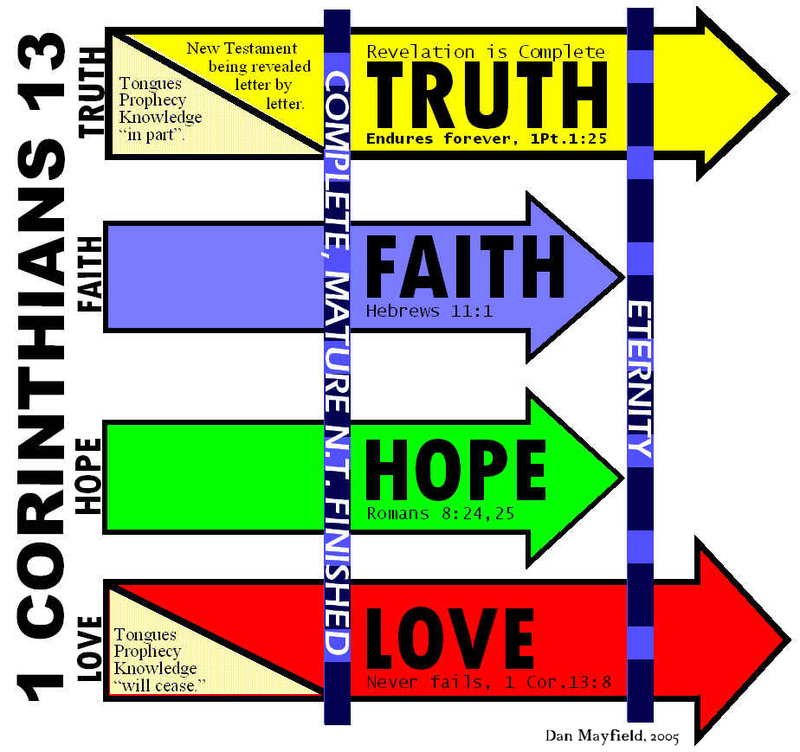 Examine the chart that illustrates how these three can only abide until Christ’s return and eternity comes. These three “abide” until then, whereas the “childish things” do not: they will be done away and will cease much earlier when “we know fully”. The following comes from men I have been taught by and respect as teachers of the Word. One Brother said the context has nothing to do with the completion of the New Testament: “saying that this is what Paul ‘meant’ in 1 Cor 13 exceeds the evidence of the text.” He goes on to say that verse 12’s, “I will know fully”, is “eschatological”, a reference to things yet to come in our heavenly future. I respectfully disagree. That the New Testament had a completion point is without question, whether the Christians had it in mind or not. The Holy Spirit was responsible for seeing it to completion, while ensuring that the Church had the necessary supernatural gifts to keep it fully informed until that time. Yes, Paul was very concerned that the Corinthians use the gifts they had in love, because without love everything was pointless. Paul said the gifts would cease and be done away with, but love, faith, and hope would remain. But there is one more thing the Church needed; it needed truth. Though the New Testament, and its completion, isn’t specifically mentioned, it is inferred. The purpose of the supernatural gifts was not to act as a filler for a shortage of faith, hope, and love: the supernatural gifts filled in the gaps of knowledge the Church lacked until the New Testament was completed. The message that the gifts would cease was also a message that the inspired Scripture would increase. “Knowing fully” in heaven is not, in my opinion, the message. But to teach the truth in love is the message. I wonder if there doesn’t need to be a second graphic to illustrate this point. The Church needed love and truth. They had it then and we have it today. Love is in the same form today as it was then, but the truth for the Corinthians and other churches of that time came first in the form of tongues, prophecy, and knowledge and was slowly replaced by inspired text. I don’t disagree with this brother. In my explanation, it appears that I represent a specific time at which the gifts would cease (i.e. when the last epistle is written), but that was not my intention. In fact, I believe that the gifts probably did continue on beyond that time in the Christians who had the gifts “by the laying on of the apostle’s hands.” That would allow that supernatural gifts continue on into the beginning of the second century. This would still be necessary as the copying and distributing the epistles to more churches would not be instantaneous. In my illustration, I hope to show that as one increased the other decreased, but there is room for some overlap.